Independent studies of crusher output conducted by two separate universities. VARI-STEM STEMMING PLUGS gave better fragmentation in hard rock zones. The average crusher output with conventional stemming was 410.45t/hr, while stemming with VARI-STEM® improved to 466.09 t/hr. 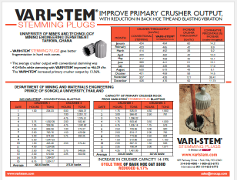 The VARI-STEM® increased primary crusher output by 13.56%. Average 293.45 ton/hr. 275.91 ton/hr..
Average 334.25 ton/hr. 327.85 ton/hr.